Having lived within a stones throw of the Norfolk Broads for a year and not ventured down there, we decided at the end of the school holidays to throw caution to the wind and turn our hand to sailing. When I say ‘sailing’ I do of course mean rent a small boat and trundle along the river at 5 mph, but in our rather nautically-challenged family, that’s as close to proper sailing as we’re ever likely to get. Not wanting to leave Charlie at home alone for the day he was duly packed into the car along with far too many sandwiches, a flask of green tea, 4 large bottles of water, a bird book, binoculars, a picnic rug, spare jumpers and several rain coats. I think subconsciously I was preparing for all possible worse case scenarios, including being swept away in a freak squall and left stranded far from civilisation on a floating polar ice cap. Surrounded by a flock of incredibly tiny unidentifiable birds. Considering the average temperature last summer just about managed to reach ‘tepid degrees’, it was rather lucky for us that the day in question turned out to be the hottest we’d had since Spring. Perfect weather for messing about the river in fact, but rather too hot (as we soon found out) for four people dressed to keep warm with just one child-sized sun hat between them. Arriving at the river we discovered one rather unsettling fact about sailing on the Broads: they really will hire out a boat to just about anyone who turns up and pays. Including, it appears, a family with not one ounce of river-going know-how between them. How scary for the water fowl indeed. We looked nervous when approaching the boat, clueless when it came to mastering the controls and positively panic-stricken when untied and told we were free to go. In fact, I believe our last words to the man in charge were “But what happens if we hit something?” Of course he laughed. Fool, little did he know. Once we’d successfully navigated our way out through the waterways and onto the river we were relieved to find that steering a boat is much like riding a bike. My son donned his full pirate outfit within minutes of setting off and both kids were in their element as they took it in turns at the wheel. The final member of our party however wasn’t quite so happy; he was clearly having difficulty finding his sea legs. This does of course raise the question of why old sailors are often referred to as ‘Sea Dogs’. 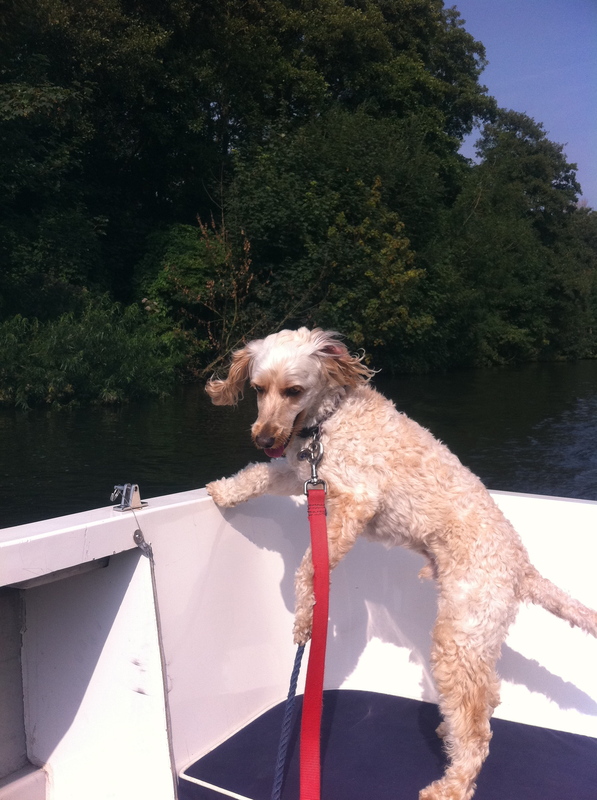 Having been incredibly tentative about setting a paw onboard, Charlie became even less enamoured with the whole idea as we headed off down river. He whined at the passing boats, barked at every passing duck and positively howled when a swan dared flap nearby. And then, as if to really drive his point home, he pooed all over the floor. In lots of little brown, liquidity puddles. It’s amazing how fast doggy diarrhoea spreads when travelling across an uneven surface. And how much it smells when out in the fresh air. And how many wet wipes are required to mop up the mess. Feeling rather sorry for himself (and possibly embarrassed) pooch took himself off to the back of the boat, laid on the cushion and peered rather gloomily over into the water. Every so often he looked our way with a hangdog expression that clearly said: ‘I didn’t ask to be brought along on this bloody boat you know’. Forward onto the return journey – after a semi-successful mooring for lunch and the only sun hat somehow making its way into the water – and all seemed to be going fine. So fine in fact that my daughter was now in charge of steering the boat and both responsible adults were sat at the back, feet up, admiring the view and drinking a cup of tea. Well when I say all was fine, I mean except for that small incident when my husband’s (very expensive) sunglasses somehow took it upon themselves to leap from his face, onto the canvas awning and into the murky depths of the river. I would have been more surprised at this rather unfortunate happening, but the memory of him managing to dropping our camera (with a weeks worth of holiday snaps) into Sydney Harbour the last time we were on water is still fairly fresh in my mind. Approaching the narrowing waterways as we came into land/park/moor up my husband thought it wise to take control of the boat, so he sent my daughter back to sit with the sea-sick dog. Suddenly Charlie’s bowels opened more, this time all over the cushion, and then, as he was pushed off that, all over the floor of the boat. He then skidded around in it a bit and tried to clamber back on the cushion, trailing the mess from all 4 paws and a rather matted, manky looking tail. This led to a rather rapid chain of events that involved my daughter letting out a squeal of horror and disgust, my husband turning around to see what the hell was going on, the boat banging straight into the side of the riverbank, me flying backwards inside of the cabin and my son falling head first off the seat. It wasn’t the best 15 seconds of the trip it has to be said. It took a fair few minutes to take stock, mop up, scrub the dog and rectify the damage – all with the few remaining wet wipes. It took quite a few minutes more before my husband managed to prise our boat off the wall … and straight into the path of another, much larger boat that was speeding towards us on our side of the river. To say it got a little bit tense would be an understatement, especially when I didn’t immediately offer to throw myself over the edge of the boat to push us off the wall. Something to do with the fact I was still up to my wrists in poo perhaps. By the time we limped into our mooring space the owner was already there waiting and the next family were ready to hop on board with their picnic. I’m rather hoping they never noticed the rather suspicious looking stain on the underside of the cushion, or the multiple bags of liquid mess I was holding as I clambered off. I’m pretty sure however (based on the fact they were busy mopping out the boat) that they did notice us hanging around the car park for another 2o minutes, as Charlie continued to drip out his business from one patch of grass to the next. And then throw up all over the nice (new) leather seats when he was finally loaded into the car. All in all it was a great day out. Slighty messy and rather smelly, but fun nevertheless. Look forward to doing the same again next year, though it obviously goes without saying we’ll be leaving Charlie at home on dry land and I’ll be in charge of the wheel when we’re coming in to dock the boat. < Previous Thank you – for hitting my blog!